8 × 3 = Required Please enter the correct value. LNG exports update: A century ago, the opening of the Panama Canal changed the face of global trade. By joining the Atlantic and Pacific oceans, ships from the East Coast no longer had to make the treacherous 8,000-mile trip around Cape Horn to reach the markets in Asia or on the West Coast. Now, 100 years later, the 50-mile-long canal is about to do it all over again. Under a $5.3 billion expansion, the canal is getting a makeover that will allow it to accommodate ships as long as three football fields, with the capacity to carry almost three times the amount of cargo. Once completed, the "new" canal will help jump-start U.S. energy exports to Asian countries that are starving for them. 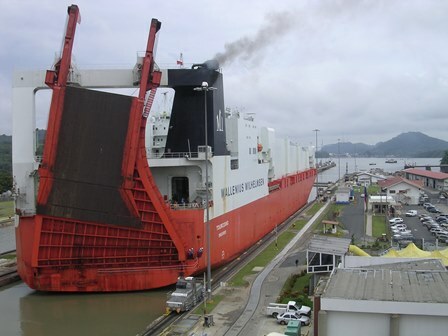 For U.S. liquefied natural gas (LNG) producers and investors, the expansion of the Panama Canal means new marketing opportunities at precisely the right time. Currently, the 100-year-old canal can accommodate ships of up to 950 feet long and 106 feet wide, with a maximum draft of 39.5 feet. The largest LNG ships are too big to navigate the canal. Next year, when an eight-year project to expand the canal is completed, the canal will be able to accommodate ships that are roughly 20% larger and can carry almost three times as much cargo. That means modern supertankers, including LNG-carrying vessels, will be able to navigate the locks of the canal. For U.S. firms, that could cut the transport time to Asia by 11 days. It also would make it easier and cheaper to transport U.S. natural gas between the east coast and west coast, without the limitations of pipelines.